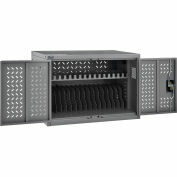 The CSC16USB 16-Device USB Charging Station Cabinet provides fast charging, convenient syncing, secure storage and cord management for up to 16 iPad, Android, Surface and Kindle tablets, as well as mobile phones and other USB devices. 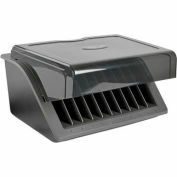 It's recommended for education, office, commercial, retail, industrial and healthcare environments. 16 USB ports deliver the fastest charging supported by each device, up to 2.4A per port. A USB uplink port connects to a host computer for wired syncing, though the CSC16USB also supports wireless syncing and simultaneous syncing/charging (up to 1.5A per port during wired syncing). 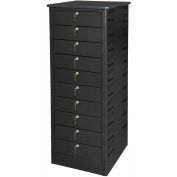 The cabinet promotes comprehensive device protection with steel construction and a black powder-coated finish for long-term durability. 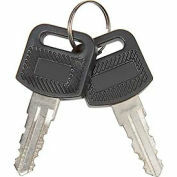 It locks with the included keys to help prevent device theft, damage or tampering. 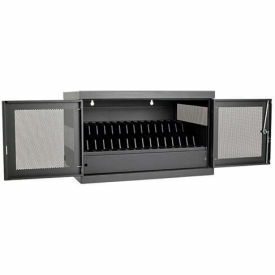 Flow-through ventilation protects against overheating, the specially coated shelves shelf helps prevent scratches and scuffs, and rubber grommets shield cords from damage. 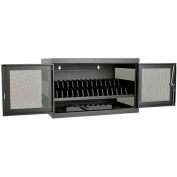 The cabinet also encourages clutter-reducing organization of devices and cabling. 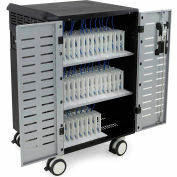 Charging cords store out of sight, and a toolless trim panel permits quick service access. 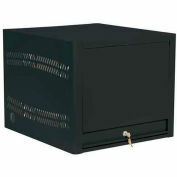 The cabinet is easy to configure. 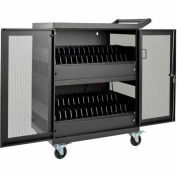 The cabinet ships fully assembled and supports mounting to a wall, desk, table, counter or floor. The front doors open 180 degrees for improved device and service access. 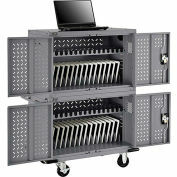 Rear-panel slots support optional wall-mount installation, and removable dividers accommodate thicker devices. 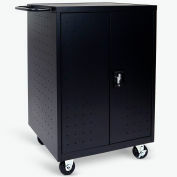 You can also convert it the cabinet to a mobile cart with Tripp Lite's optional CSHANDLEKIT2 (sold separately), and roll it where needed. Allow additional space required for the power adapters, power cords and protruding power plugs from the devices. 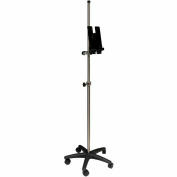 Omnimed® Mobile Tablet Stand, 22" Diameter Base, Adjustable Height Up to 7 ft.